Don Mentz was born in Melbourne on 20 October 1933. He was educated at Hampton High School, Dookie Agricultural College (DDA 1952), Melbourne University (BAgSc 1954), and the Australian National University (BEc 1970). After graduating from Melbourne University in the mid-1950s, Don joined the Victorian public service as an agronomist. He married Mary Goldsworthy in 1959. In 1960 he shifted to the Commonwealth Department of Territories, which held responsibility for the administration of the Northern Territory. Based in Darwin, he developed a vigorous program as an extension agronomist but soon demonstrated a talent for administration and management. Administration of agriculture, animal production and natural resources in the NT was at that time vested in several branches, and by 1965 Don was acting director of the Agriculture Branch. In that year, he attended the 12th International Conference of Agricultural Economists, Lyons, France. This probably gave him his first taste of international agricultural research. In that year also, Don was transferred to Canberra where he led the Department of Territories’ forestry, fisheries and water resources section. When the Department was disbanded in 1968, Don was reassigned to the Department of External Territories and became an assistant secretary (1969-72) and then first assistant secretary, Economic Affairs Division (1972-73). Like many others, he was swept up in the arrangements for independence of Papua New Guinea; during those years and in subsequent roles he visited PNG more than fifty times. Among his many tasks was an assessment of Japan’s future economic role in PNG. In 1972 he became a member of the board of directors of the PNG Investment Corporation. Just before PNG independence, the Department of External Territories was abolished and Don moved into the newly created (Office of the) Australian Development Assistance Agency (ADAA), which in his words, “was set up [with] staffing … about 50/50 from the old Aid or Project Branch of Foreign Affairs and the rump of the old Department of External Territories”. Les Johnson, then administrator of PNG (which at that time received about 70% of Australia’s aid), became its first director general. Don became the head of the division that administered ADAA’s policy development, administrative services and assistance to multilateral programs and Non-Government Organisations. He remained with ADAA (which became ADAB in 1977 and, later, AusAID) for four years (1973-77). During this time he interacted with Sir John Crawford, who chaired ADAA’s Advisory Board from 1975-77. John Kerin, then the youthful ALP Member for Macarthur, was also briefly on this board. In 1975 Don led the Australian delegation to the second meeting of interested governments on the formation of the International Fund for Agricultural Development (IFAD). At that time, Australia’s interaction with the international banks (the World Bank and the Asian Development Bank) was shared by ADAA/ADAB and the Department of the Treasury, and in 1979 Don shifted to Manila as director, Country Development, Asian Development Bank. He remained there until 1981. It is said that he took leave without pay from the Commonwealth Public Service to take up this position. Returning to Canberra, Don was briefly (1981-82) deputy secretary in the Department of Business and Consumer Affairs. He held responsibility for the Australian Customs Bureau, which contained 4,000 staff at that time; at one point Don was acting secretary of the department and dealing with two competing staff unions while Australia’s customs operations were restructured. Don returned to the Department of Territories and Local Government (1983-84) as deputy secretary, and as acting permanent secretary of the Department for three months during the absence of the permanent secretary. As well as his direct involvement in the administration of the NT and Australia’s offshore islands, he was responsible for a number of major economic development projects in Canberra and represented the department on the Canberra Development Board and the Canberra Electricity Authority. In 1983 he led a fact-finding mission to China, organised by IFAD, assessing agricultural assistance projects that had been proposed for funding. In 1981 IFAD had become one of the first international donors to finance operations in China, commencing with its Northern Pasture and Livestock Development Project. Management of China’s grasslands later became a continuing focus of Australia’s development assistance to China. In 1985 Don became director general of the Commonwealth Agricultural Bureaux (CAB)—the precursor of the modern CABI—in the United Kingdom. At that time CAB was a non-profit organisation, funded by 29 member countries, comprising four specialist research institutes and ten bureaux, with field stations in Trinidad, Kenya, India, Pakistan and Switzerland. It operated from 16 locations in the UK, with a staff of about 400. A recent review had recommended that CAB’s Information Services should operate on a self-sufficiency basis—a fundamental change from the system of funding by member countries. Don centralised the dispersed bureaux to a single location. Centralisation was a tremendously disruptive time for the Bureaux, but Don handled the process with firmness and sympathy, working closely with the staff and unions. CAB became CAB International in 1986. Don envisaged CABI as a key player in the international agricultural research (IAR) arena, and established what was called the Partnership Facility (later CABI’s Development Fund), through which donors could help developing countries purchase CABI’s services. This enabled CABI to demonstrate global capability in a range of fields of scientific research. Writing later, the World Food Prize-winning scientist MS Swaminathan (who chaired the Board of CABI during Don’s tenure as DG) described him as an “extraordinarily gifted and capable management specialist. His new strategy for CAB International was truly a turning point in the history of that old organisation”. 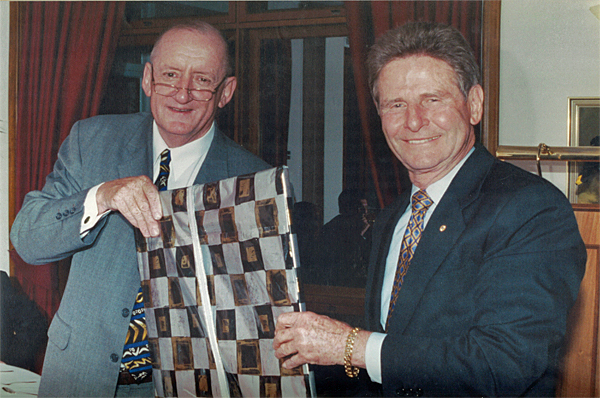 In 1994 Don was appointed a Member in the Order of Australia (AM) for his work with CABI. In 1999 he was appointed a Fellow of the Australian Academy of Technological Sciences and Engineering. After completing his appointment at CABI in 1992, Don undertook consultancies in South Africa, Guyana, Egypt and Ghana, and turned his attention to various business activities. He established Mentz International Trading (1993-2001) and became its managing director. Don had developed an interest in the Crawford Fund during his years at CABI and had been a member of the small team led by Jim Ingram that reviewed the Fund in 1993. In 1999 he was appointed Executive Director of the Crawford Fund, working closely with Jim Ingram (who by now was chair of its Board). Jim soon stepped down and Tim Fischer was appointed to chair the Board. This heralded a three-year period of rapid development of the Crawford Fund. New state programs were established in South Australia (2000) and the Northern Territory (2002), and a State Committee chaired by John Kerin was established for the New South Wales program. With generous support from donors, two awards were established: the Derek Tribe Award (first awarded in 2001 to Dr Sanjaya Rajaram, director of CIMMYT’s wheat program); and the Crawford Fund Fellowship (first awarded in 2002 to Dr Ha Thuy Hanh, a young woman at the National Veterinary Diagnostic Centre in Vietnam). A new five-year funding arrangement for the Fund was negotiated with the Australian Government. A Crawford Fund website was constructed in 2001 and soon afterwards Cathy Reade was re-appointed to lead the Fund’s Public Awareness Program. The Crawford Fund Interest Group was established to provide a means of involving the countless individuals who wished to provide personal support for the Fund’s activities. However, Don’s most important contribution to the Crawford Fund was to lay the basis for the development and implementation of improved management practices and processes. Every aspect of management was scrutinised and improved: financial management, records management, insurance arrangements of all kinds, reporting, internal communications (especially with the Board and Management Committee), human resources, interactions with the Australian Academy of Technological Sciences and Engineering—everything went under the microscope. By the time Don handed over the reins in 2002, the Crawford Fund was substantially renovated. The quality of Don’s retirement was reduced in 2007 when he suffered a stroke. Some years afterwards he entered a care facility near Townsville. He died on 30 October 2015. He is survived by Mary, three children, ten grandchildren and two great-grandchildren.